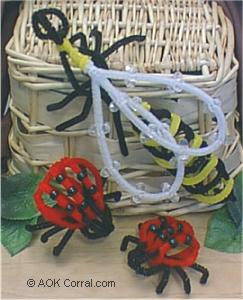 Create bugs out of pipe cleaners with this fun bug craft project. 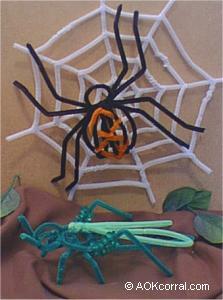 Includes instructions for all bugs; Ladybug, Bee/Wasp, Grasshopper, & Spider with Web without margins, ads or logos. To view step by step instructions for any of the bugs in this project, please click on the links below. You are welcome to print out the instructions for your personal use. For easier printing and user friendly instruction sheets please purchase our PDF version for yourself or to use with your school group or Sunday school group. Makes a great busy project for kids to do on a rainy day. Fun to do with a group of kids or as a family.